Do you like eating great tasting food but also wish to drop weight? Burning fat is all about maintaining a caloric deficit which will almost certainly make you hungry most of the time. Fortunately, there's a new product that can change that. Introducing Skinny Piggies. What's Skinny Piggies? First, let's understand what fat loss is. In order to achieve this caloric deficiency you need to either boost your energy output through added exercise or decrease your food intake. In order to get the most ideal results, you may want to do both. Skinny Piggies help you eat less and decrease your caloric intake and that makes achieving fat loss easier. Include added daily work out in order to help step up the fat loss process. Hold up though. This sounds good in theory, but try cutting calories and sugar cravings will set in, as well as hunger that is hard to ignore. And that's where Skinny Piggies can really help! Skinny Piggies are fun, delightful healthy treats you don't have to feel guilty about! Enjoy the savory taste of these strong appetite suppressant gummies and let them do the rest of the work. Ok. So, what exactly are the gummy supplements doing for you? Appetite is primarily driven by two things: caloric intake and the stretch in your stomach. When you eat, your stomach becomes full and the food stretches against the stomach walls. This is what creates the feeling of being full and stops you from eating more. When you ingest a Skinny Piggy about 30 mins prior to your meal with a big glass of water, it's going to gently form a gel, activating stretch receptors in the stomach, letting your brain know you just consumed loads of food. So that when you eat your meal later, you're already partly full and eat much less calories because of it. It means you can fight desire for food and food cravings, hunger, and keep your calories down, without seeming like you're dieting. When you eat the Skinny Piggies appetite suppressing gummies before meals, they will form a gel-like coating around your food, which slows the release of the carbs you consume into the blood stream. This manages to keep your blood glucose levels more steady and makes sure that your body remains in weight loss mode for long time. It can perhaps even help make your gym sessions feel much easier. Skinny Piggies have zero artificial additives - you can actually read and pronounce all the active ingredients. 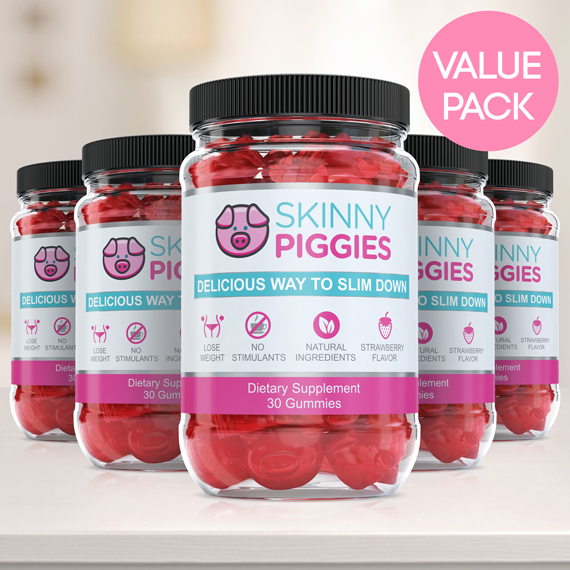 The nutrient rich, natural ingredients used in Skinny Piggies also have other health-related benefits including support for strong hair and nails, glowing skin, and anti-aging properties. Skinny Piggies also have zero stimulants and zero harsh chemicals. No stimulants means no getting tired and no restrictions on when you can use them. Day or Night. No harsh chemicals means Skinny Piggies are gentle on your stomach. Finally, what other weight loss pill is as tasty as a strawberry gummy? 'Thought so. You will enjoy eating these so remembering to take your health supplement will no longer be a stumbling block. They're simple to use and anyone can get going right now. Try just one and we're sure they will certainly become a highlight of your day.